Greetings gardeners, outdoorsmen, and anyone else stumbling across me. Allow me to introduce myself. My name is Gordon. 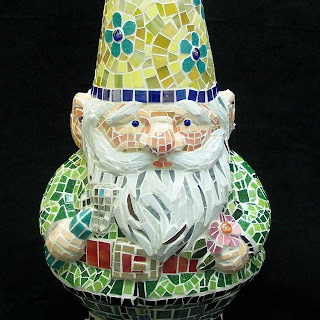 I am a garden gnome. 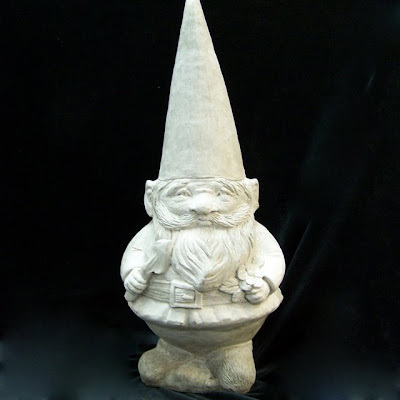 Or at least, I think I am a garden gnome. I am holding a garden trowel and a flower. Right now however, I am not in a garden, I am trapped atop a high table in a brightly lit room. About a month ago I’d say it was. I was standing in a field. It was a sunny day, but a wee bit cool. A field of clover and weeds of all kinds it was. I was sneezing. Bees were buzzing around my ears. Quite unpleasant. I was nearing a state of panic actually, being allergic to bees. When lurching toward me, comes a woman, being pulled by a small, unruly jumble of a dog. Next thing I know, she kicks me right in the belly. Such howling and cursing I’ve never heard! Well, after this woman calms herself, she spots me. She clears away the water droplets from her eyes, and bends down to get a look at me. Right close she gets. Nose to nose. Her pooch meanwhile is rolling and twisting on its back, snorting and grunting. Ill-mannered, the both of them. Well, the woman mutters something, laughs out loud, and doesn’t she pick me up, letting out a grunt herself! (I am no light-weight) She carries me to her car, heaves me into the back seat, and straps a belt across me. Off we go. Bye-bye field of clover. The mutt, panting dog-breath, and whining. Until we stopped here, where I was put out in the yard and sprayed all over with a foul-smelling liquid. A sealer of some sort, must be. After being left to dry in the sun for I don’t know how long, I was carried up a flight of stairs to my present location. So that’s my story. I am a smidge nervous. I can tell she has plans for me, this woman. Jars and tubs of colorful bits and pieces are all I can see from here. What will become of me? Please visit me again soon to find out--I may need your help! Part II coming this month--check back!